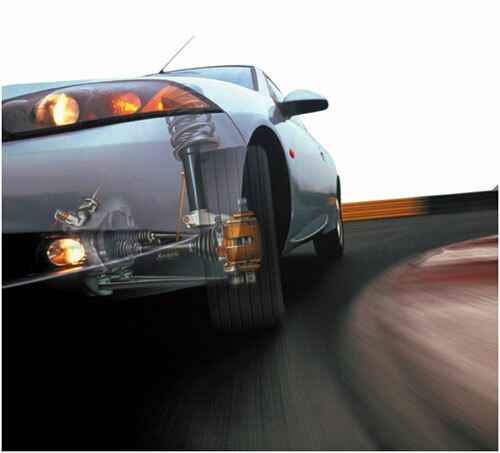 The run-flat tyre has been the desire of many tyre manufacturers over the last 30yrs. Its obvious safety features encouraged exhausting development advances but despite this the original embryo the Run-Flat tyre looked like it was deemed to failure. In the late 90's Bridgestone launched their version of the RFT (Run-Flat-Tyre) which in essence is not too distant from an ordinary tyre in appearance. Nevertheless this tyre, undressed is far from similar to a conventional tyre. 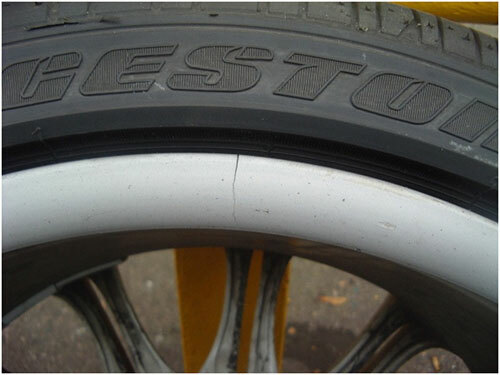 Bridgestone's design required the tyres sidewall to be reinforced, "armoured" is a closer description so that the tyre is able to support the car when fully deflated. I, for one salute Bridgestone for finally bringing this necessary safety feature for the first time in a useable context, but unfortunately there are problems. Most people would know that the tyre full of air has a reasonable level of compliance acting as our first line of defence deflecting the poor road condition however things appear to be quite different with the Run Flat. By compromise, all BMW's fitted with RFT's have downgraded (softer) suspension to absorb the migration of these road shocks. Unfortunately this doesn't appear to be perfect as we are starting to notice that this shock migration appears to transmit some of these forces to the wheel rim, and actually cracking it in some cases without amazingly, any apparent harm to the tyre itself. We are currently monitoring this but it is something that owners of Run Flat Tyres must keep a keen eye on and in the avoidance of doubt... stay away from pot holes. As with a lot of things today we have to make compromises and the safety benefits of Run Flat Tyres are not in question, though we will continue our studies into this shock migration very thoroughly. However, "What about the actual inconsistent and premature tyre wear?" Wheels In-Motion, surprise surprise, has found the solution! The BMW suspension allows superb handling characteristics providing that the tyres contact patch can be maintained. In order to do this the wheels vertical position (camber) is tilted and along with careful and sensitive suspension and geometry adjustments to compliment this, allows both tyre and suspension to follow the same radii thus maintaining that all important tyre contact patch. The consequence of camber alone conically deforms a normal tyre sidewall, however if the correct maths are used in suspension adjustment, geometry and alignment thus allowing the cars weight to be evenly distributed across the tyre, all can be encouraged to work together in harmony. 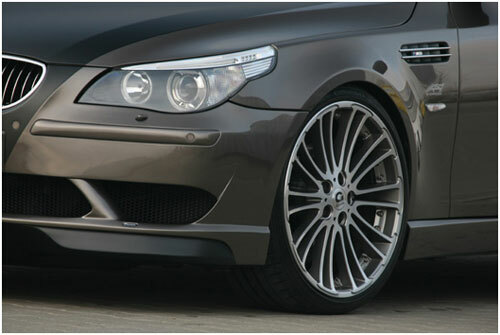 The problem some BMW's have is that the RFT's do not deform and do not allow a conical profile because of the rigidity of the tyre and sidewall, meaning they cannot distribute the cars weight evenly easily, but before you depart your beloved BMW in despair, once again we have solutions to address this. We can establish the camber curve and adjust the chassis accordingly allowing the RFT to maintain a solid, predicable footprint during the suspensions transitions. Our chassis adjustments belays the fact the RFT cannot deform, maintains the BMW handling and prevents the adverse tyre wear. Once again, regular alignment checks and calibration by Wheels In-Motion will maximise tyre life and handling without compromise. It just needs a little more thought, care and attention. Safety. The vehicle continues on a straight course, even after a sudden or slow puncture on one or several tyres, and remains in control. All dynamic safety systems such as the ABS, DSC, CBC etc. are still fully active. Added safety and convenience. The damaged tyre no longer needs to be changed at the time and place where the failure happened- which might be on the highway, in a tunnel, in the rain or in a dangerous area. Weight reduction. No emergency spare wheel means a saving of about 20 kg, which helps to reduce fuel consumption. Integrated Run Flat indicator or TPM (Tyre Pressure Monitor). This enables early detection of slow punctures and thus helps prevent tyre damage. Sensors alert the drive if tyre pressure has dropped. More than 70% of all tyre damage is due to slow punctures. How does Run Flat work? A Run Flat system comprises three critical components. The Run Flat tyre, the Extended Hump (EH2) rim and the Run Flat indicator. Here is how each of them work in detail. Run Flat tyre. The concept of the self supporting tyre has actually been around since the late ‘60’s, but without the two other components was completely useless. The major difference between a conventional tyre and Run Flat tyre is the sidewall. The sidewall of a Run Flat is thicker and thus strengthened. This means that with no pressure, the sidewalls are supporting the tyre, the rim and in turn the car instead of air pressure alone. Run Flat indicator. Also known as TPM. Not all drivers notice the deteriorating handling of their vehicle as it gets spongier as a result of a slow puncture. This defect is even more difficult to recognise in a Run Flat tyre because the sidewalls remain rigid. The warning system therefore becomes vitally important as it is the only reliable way of alerting the drive to such a failure. That said, it does not exempt the driver from his obligation of checking the inflation pressures on a regular basis. Every 14 days is recommended. The Run Flat indicator therefore monitors tyre pressure by consistently comparing wheel speed and revolutions with the help of the signal from the ABS system. A significant loss of tyre pressure changes the circumference of the tyre and accordingly, the running speed of the tyre on the road. The driver is informed by both a warning light and an acoustic signal. Designed to warn the driver of an excessive loss of pressure, the system provides a warning as of a road speed of 15 km/h and with a loss in pressure of more than +- 30% from the last set value. Q – History of Run Flat at BMW? A – The first vehicle to have Run Flat tyres fitted in the BMW Group was the Z8 and MINI with great success, then Z4 E85/86, 5 Series E60, 6 Series E63/64, 1 Series E87/81/82/88, 3 Series E90/91/92/93, X5 E70 and X6 E71. Q – What BMW vehicles do not have Run Flat tyres yet? A – Currently the following vehicles do not have Run Flat yet: X3, 7 Series and M products. Q – Why has BMW developed this system? A – Every driver’s nightmare: a tyre suddenly blows at high speed on the motorway, the car slews and can be brought under control only with difficulty. A hair raising situation even for experienced drivers or in bumper to bumper traffic on a secondary road where there is hardly enough room to safely leave your car without risk, BMW have found a solution in a set of safety tyres including a Tyre Pressure Monitor (TPM) system. Run Flat tyres therefore provide vital safety benefits. Q – What is the availability of Run Flat tyres? A – BMW SA has a network of dealers across the country that not only will be able to supply you with the required tyres, but are also able to fit them to the required quality standards. Most tyres suppliers also supply Run Flat tyres. A further extension of our support for this technology is through BMW-On-Call. Q – How far can one travel with a punctured Run Flat tyre? A – The flexible rubber springs in the side walls of the tyres ensure the tyre largely retains its lateral support even in the event of sudden, total pressure loss and remains operable within certain limits (150 km partly laden at max. 80 km/h, 50 km fully laden and 250 km in a vehicle that is not heavily loaded). In the case of typical punctures with very slow pressure loss, the vehicle can still be driven for approx. 500 to 2000 km at max. 80 km/h as from the TPM warning. Q – Can I replace a Run Flat tyre with a standard tyre? A – Technically Yes, BMW however does not recommend this (with the exception of an emergency situation where a Run Flat tyre is not available. In this case the tyre must be replaced with a Run Flat tyre at the earliest opportunity). The reason for this is that no spare wheel will be fitted to vehicles with Run Flat, therefore there is the risk of a situation of getting a puncture and having no spare wheel and no run flat tyre to drive on. Note: 5 Series (E60) 530i, 530d, 545i and 550i are the only models to have Run Flat technology and an emergency spare wheel. Q – What is the price of Run Flat tyres compared to normal tyres? Q – Will I get the same mileage out of the Run Flat as I do with a normal tyre? Q – How do you identify a Run Flat tyre? Q – What does RSC stand for and how does it work? A – (R-un flat S-ystem C-omponent). Indicating that these tyres are merely one component in a more comprehensive safety system. Q – How do I initialize the system? Q – Do other manufacturers use Run Flats? A – Recently, Audi and Mercedes have also begun to recognise the advantages of Run Flat tyres. Mercedes now offers them as an optional extra for every new model. Audi is about to follow BMW’s lead and will introduce run flat tyres as standard for its vehicles in the near future This will inevitably lead to these tyres becoming even more readily available from tyre retailers. Q -Is it true that Run Flat tyres are subject to more wear than conventional tyres? A – No. If both tyres are subject to the same stresses, they will both experience equal wear. Vehicle durability tests performed on identical test tracks have confirmed this time and time again during the design and development process, using different BMW Group vehicles. However, Run Flat tyres respond a little more sensitively to changes in tyre pressure – to develop correct user behaviour, it is necessary to understand the function of the Run Flat indicator or TPM (Tyre Pressure Monitor). This does not replace regular pressure checks. In addition, the new models are consistently more powerful than the old ones. While this enables more dynamic driving, it also exposes the tyres to increased stresses and thus may reduce their service life a little. Q – Is it true that the ride comfort achieved with Run Flat tyres is inferior to that of conventional tyres? A – The ongoing design optimisation of Run Flat tyres and the adjustment of chassis and suspension systems have eliminated the initial drawbacks of Run Flat technology in terms of ride comfort. The new BMW Group vehicles have exactly the desired balance between handling ability and ride comfort. Q – Why do Run Flat tyres have flattened shoulders? A – For optimum handling, high-performance (HP) tyres have a smaller tread depth in the shoulder area than in the wider longitudinal grooves that contain the wear indicators. So what looks like wear on the outside shoulder of the tyre is in fact not tread wear at all. Q – At the end of the day, a spare wheel gives you an added feeling of safety – doesn’t it? A – The spare wheel has not been dropped – it has been replaced with a better and safer solution. With Run Flat technology, what you effectively have is four spare wheels. The emergency capabilities of Run Flat tyres listed in the user manual and in advertisements all relate to completely deflated tyres (0 bar): in this condition, which in practice is very rarely encountered, Run Flat tyres are designed to still last a considerable distance. Driving carefully (max. 80 km/h), with four persons on board, this distance averages around 150 km, or 50 km with maximum axle load or 250 km with a light load. This “Run Flat distance” represents the built-in reserve of the Run Flat tyre. Q – Can I use conventional tyres on a BMW that was designed to have Run Flat tyres? A – For all new vehicles which have been specifically designed with the Run Flat technology in mind, as well as all future vehicles of this type, conventional tyres can theoretically be used, but their use would not make sense. The engineering parameters and specifications of Run Flat tyres and conventional tyres are quite different, due to their different design concept; providing equally optimised conditions for both types of tyres would require a different vehicle and suspension design. Q – What is the difference between the Run Flat TPM (Tyre Pressure Monitor) and TPC (Tyre Pressure Control)? A – The Run Flat indicator indicates tyre failures, while TPC checks the tyre pressure. TPC monitors tyre pressure on an ongoing basis, based on direct measurements. The Run Flat indicator does not measure tyre pressure directly; it detects differences in the wheels’ rotational speed and thus can only indicate major pressure changes in one tyre compared to the others. This is sufficient to effectively address the most frequent causes of pressure loss encountered in driving, and the resulting tyre failures. The most common situation is a drop in pressure in one tyre. And the Run Flat indicator is enough to indicate to the driver that one of the Run Flat tyres is losing pressure. Q – How should I deal with complaints about “abnormal tyre wear”? A – When customers complain of “abnormal wear” and it is suspected that this may be due to a lack of pressure maintenance (manual pressure checks), the control units for the Run Flat indicator and TPC should be checked for the mileage count when the most recent initialisation took place. Based on this mileage count, it is usually possible to guess when the most recent initialisation and pressure check were performed. If this was a long time ago, then it may be assumed that tyre pressure was not checked and maintained on a regular basis. Q – Should front and rear wheels be swapped on a regular basis? A – Swapping tyres from front to back is not recommended for BMW vehicles, since it would impair dynamic performance. Tyres used for longer periods on cambered rear wheels are particularly likely to cause an unpleasant ride when mounted on the front wheels. In addition, such an instruction would run counter to the trend for longer and longer customer service intervals. Q – Is it possible to repair a damaged Run Flat tyre? A – BMW does not recommend tyre repairs. Tyres are a major safety component and should never be used in a “weakened” condition. This is particularly important for high-performance tyres, be they of conventional or Run Flat design. Note that we are not saying that you “cannot” but rather that we don’t “recommend”. Even if you refer back to a BMW owner’s manual from 1982 (long before Run Flat) you will find that “BMW do not recommend the repairing of tyres”. The procedure for repairing a Run Flat tyre is however the same as that for repairing conventional tyres, i.e. any standard puncture (in the tread area) can be repaired by an authorised specialist vulcaniser. The vulcaniser together with the customer however assumes responsibility for the work carried out. BMW cannot assume product liability for repaired tyres. This would have been the case with a conventional tyre as well. BMW however recommends that a tyre should only be repaired in an emergency, subject to the above. The repaired tyre should then be replaced at the earliest opportunity. A Run Flat tyre may also not be repaired if the vehicle has been driven in “Run Flat mode” (in other words, with 0 tyre pressure). Note that this is again exactly the same as what would have been the case with conventional tyres. We hope that this clears it all up for you. It should also be mentioned at this point that if at anytime you have a question about Run Flat tyres, or you experience any problems, BMW On Call are there to help and are fully equipped to do so. Just in case you don’t have it, their number is 0800 600 777, and the BMW Customer Service number is 0800 600 555. If you are still in doubt, speak to the Aftersales department of your local dealer.